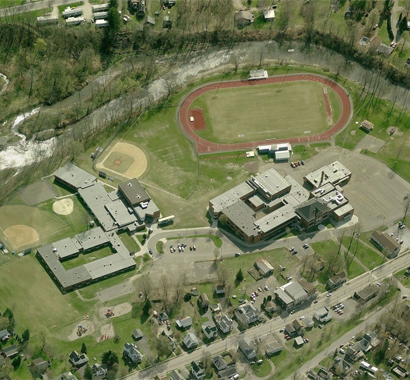 Candor Central School District is located in Tioga County, southeast of Cayuga Lake between Ithaca and Binghamton. The district's elementary school (K-6) and junior-senior high school (7-12) serve nearly 800 students. The $3.9 million EXCEL Renovations Project, completed in 2009, included renovations to both schools. The elementary school scope included control upgrades at unit ventilators. At the high school, work included parking lot modifications, a new entrance canopy, partial chimney removal, a new emergency generator, new lighting controls, fire alarm modifications, and a new auditorium entrance. Both school facilities also received exterior caulking and repainting, boiler replacements, new roof top units, miscellaneous asbestos abatement, and lighting replacements in the gymnasiums. District residents approved a $21.5 million improvement project in 2015 with no local tax impact. Long in need of a new bus garage, the district was able to cut the facility's projected costs in half by purchasing and renovating an existing building. LED lighting and a new solar field will also serve to "zero out" the District's electric bills for 20 years, saving an estimated $2.67 million over the life of the project. Other project highlights include district-wide 21st century technology, safety and security upgrades, along with renovations to kitchens, locker rooms, roofs, windows, and parking / site circulation. Two new classrooms will be added for special education and the District's popular culinary program. All classrooms will receive upgrades to reflect instructional trends at model schools across the country with dynamic flexible work stations that will provide opportunities for enhanced creativity, communication, and collaboration among teachers and students.